Representatives of media establishments, top businesses and advertising groups, and students in the country convened last November 16 to 19 for the biennial Philippine Ad Congress (PAC). This year, its theme was “Changing the Game,” pointing to the evolution of media in the digital age (Escandor Jr., 2011). 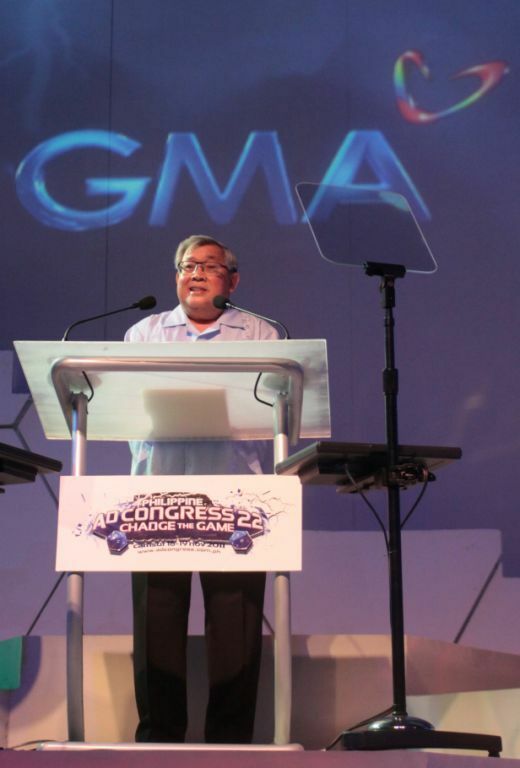 At the congress, ABS-CBN President Eugenio Lopez III said that the oldest and [biggest] media outfit will still concentrate on improving their television programs, while boosting investments on technology that will scale up their delivery of public service (Sunio-Granali, 2011). He was joined by the top executives of rival networks TV5 and GMA 7, whose CEO Atty. Felipe Gozon, said that the television is still the “medium to beat.” He believes that Filipinos will still turn to the television for entertainment for many years to come, and that the battle will go from simple content to high quality content (Sunio-Granali, 2011). For TV5’s Manny Pangilinan, technology has completely altered the way people consume media products. He said that TV5 will strive to become the number one provider of digital content to the Filipino people (Sunio-Granali, 2011). PAC is a celebration of the Philippine free media and the creativity of the minds behind it. But aside from visions of the future, the PAC also discussed serious topics on advertising, among them the performance-based payment, as raised by Zenith Optimedia’s CEO Venus Navalta. In this scheme now used by TV5, one determines a reasonable fixed price for each rating point that a program gets. It provides media buyers (companies placing ads on television and on other forms of media) the option to purchase ad spots in programs with the same number of viewers as others but which has lower ratings and lower production costs. This way, they can still reach the same audience for a smaller price. This spells value-for-money for media buyers and some form of regulation for media sellers. The Kapisanan ng mga Brodkaster ng Pilipinas sets a minimum of 18 commercial minutes per program hour. However, Reyes notes that while networks try to follow this rule, demand for ad spots in high-rating television shows often prevails. If implemented by all networks, Reyes argues that this could keep other good programs on air, by having enough commercial loads (Reyes 2011). The advertising industry (in broadcast and print media) is valued at 226 billion pesos annually as of 2010 (Reyes. Jr., 2011). This development tells us that, as TV host Boy Abunda concludes in his master’s thesis and shares in his program Bottomline, “The kind of media that we have reflects the kind of public that we have.” In large part indeed, media groups simply respond to the needs and wants of their audience. But it also makes us realize that innovation in the business of media buying and selling can help improve the quality of the programs that we have on television. If the performance-based payment scheme will be start of a string of innovations for the advertising industry, then the media can greatly improve towards being more responsive to the need of their audience. They can focus on creating content that will promote critical thinking instead of just giving the public the same kind of shows over and over again simply because they need not always succumb to the sponsors’ preferences. Especially during primetime which gathers the viewers more and is marked by greater news and current affairs content, innovation in advertising can allow the networks to support more educational programs. Escandor Jr., Juan. The Philippine Daily Inquirer. November 19, 2011. http://entertainment.inquirer.net/21405/ad-congress-told-tvs-big-3-not-a-crowd (accessed November 24, 2011). Reyes, Resti Jr. The Lobbyist/Mind Wars. November 20, 2011. http://www.thelobbyist.biz/perspectives/mind-wars/1245-ad-congress-postscript- (accessed December 08, 2011). Reyes. Jr., Resti. The Lobbyist. May 10, 2011. http://www.thelobbyist.biz/perspectives/mind-wars/749-the-advertising-industry-how-much-money-are-we-talking-about (accessed November 24, 2011). Sunio-Granali, Demai G. Philippine Entertainment Portal. November 21, 2011. http://www.pep.ph/news/32006/abs-cbn39s-eugenio-lopez-iii-for-me-and-for-the-people-at-our-network-working-at-abs-cbn-is-not-a-job-it-is-a-calling/1/1 (accessed November 24, 2011). —. Philippine Entertainment Portal. November 19, 2011. http://www.pep.ph/news/31987/Manny-Pangilinan-sees-TV5-at-the-helm-of-digital-media-revolution-in-the-Philippines (accessed November 24, 2011). —. Philippine Entertainment Portal. November 21, 2011. http://www.pep.ph/news/32005/gma-739s-atty-felipe-gozon-says-as-far-as-we-are-concerned-we-are-number-one (accessed November 24, 2011).